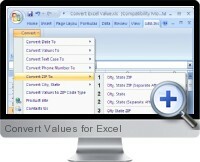 Convert Values for Excel can convert cell values to different formats and data types quickly and easily. The Excel add-in provides quick access to convert selected data into consistent formats to speed up analytical tasks and data management. Convert Excel dates to weekday, month, quarter, year, day of year, hour, minute or second. Convert Excel text case to proper case, lower case or upper case. Convert Excel data types to general or text. Convert phone numbers to a uniform format. Convert ZIP codes to city state ZIP or convert city and state to ZIP, etc. Automatically apply conversion to entire columns.